The new Titleist Pro V1x golf balls. The new Titleist Pro V1 and Pro V1x golf balls (both $47.99/dozen) are designed to be faster and longer than the previous models while maintaining the same elite-level short game performance and responsive feel. A key to the enhanced distance is a new 2.0 ZG Process Core in which the outside is stiffer and the inner portion is softer — the result is lower spin on long shots and faster ball speeds. 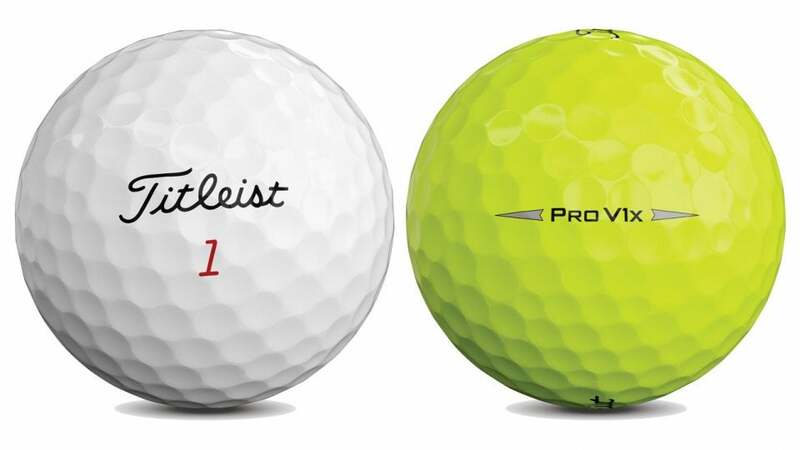 The new Titleist Pro V1 golf balls will eventually be available in white and optic yellow. In addition, a thicker (14-percent thicker for Pro V1 and 11-percent for Pro V1x) and faster ionomeric casing layer, which resides just below the cover of each ball, further contributes to less driver spin. Finally, a 17-percent thinner cast urethane elastomer cover system also allows for more speed and distance without losing any of the greenside precision and feel normally associated with Pro V1 and Pro V1x. In addition to the impressive new technologies that yield more distance, both the three-piece Pro V1 and four-piece Pro V1x will be available in both white and optic yellow for the first time ever. The new Titleist Pro V1 and Pro V1x golf balls. Michael Mahoney, vice president, golf ball marketing at Titleist, says, "As the demand for yellow Pro V1 and Pro V1x started to grow, our material scientists got to work on what we knew would be a significant R&D undertaking. The performance and durability characteristics of our cast urethane are the best in the industry. It's because we formulate and manufacture the cover ourselves that we are able to control the material with such precision and consistency. While it may seem pretty straight forward, recreating those properties in yellow required a new and complex chemistry with considerable iteration until we got it just right." New Pro V1 and Pro V1x are available at retail in white on Jan. 23 with optic yellow models available on March 15.